Today the name Heckler & Koch is synonymous with auto pistols and assault rifles for police and military use, but this was not always the case. This article will take a look at the origins of the Heckler & Koch Company and its first production pistol, the Model 4 (HK4) which was released in 1968. The name was chosen because the pistol was available with four interchangeable barrel and spring kits: .22 Long Rifle, 6.35 mm Browning, 7.65mm Browning and 9mm Browning Short. From today’s point of view none of the above calibers is particularly effective for self-defense. But the HK4 was somehow commercially successful, perhaps because it was accepted as a service pistol for the German Customs Police (Zoll), though it was never quite able to compete with the Walther PPK which was reissued by the Walther Company in the 1950s. One of the owners of the Heckler & Koch Company, Alex Seidel, had been the primary design engineer behind the Mauser HSc (the Hahn- Selbstladespannpistole, Ausführung c) before World War II. So it is not surprising that the HK4 is closely related to the Mauser HSc. The idea of interchangeable barrels was not new either. 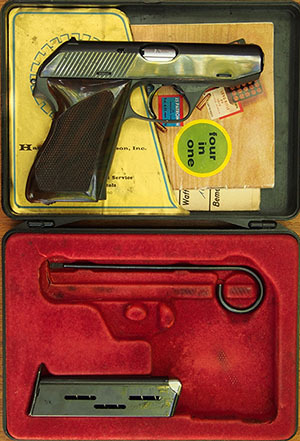 In 1934 the August Menz Company had released the “PB Spezial” which was issued with interchangeable barrels in 9mm short, 7.65mm Browning, .22 centerfire and 4mm. Oberndorf am Neckar, in the far south of Germany, has been a center for weapon-making since at least 1812, when Frederick I of Württemberg established the royal weapons factory there. In 1897, the royal weapons factory, which had been manufacturing Mauser-designed rifles for some time, became Waffenfabrik Mauser AG, and later Mauser-Werke AG. According to Weaver, Speed, and Schmid, in their book Mauser Pistolen: “Mauser-Werke AG, Oberndorf was targeted and bombed by the Allies on February 22, 1945. Physical damage to the facility was considered light, but the attack did serve to cripple the firm’s power plant...” After the war , the Allied Powers agreed that all weapons facilities in Germany were to be demolished, but the French were desperate for weapons for their new war in Indochina and their own infrastructure had been badly degraded, so they put the Mauser facility back into production through 1946, and even after that time, as they were shipping major machinery back to France, some arms-making activity may have continued. Mauser had been the most important employer in the region and for many families it had been their only source of income. After the factory was closed, most ex-employees were completely out of work. Three former Mauser engineers, Edmund Heckler, Alex Seidel, and Theodor Koch, wished to support economic development and provide jobs. The obvious solution was to start a metal fabrication company, since they already had a trained workforce. The core of the new company was the Ingenieurbüro Heckler (Engineering Office Heckler) which Edmund Heckler founded in 1948. Heckler and Theodor Koch became partners and renamed Heckler’s company Heckler & Koch GmbH on 28 December 1949. The H&K company website states that, “Alex Seidel joined the team in 1949.” Why his name is not part of the company name is not explained. Early on, the company focused on parts for sewing machines. Later they produced parts for bicycles, household appliances, and office equipment. In a short time the initial production facilities were outgrown, so the company moved to the former barracks of the Reichsarbeitsdienst (Reich Labor Service) at the Lindenhof in Oberndorf. Heckler & Koch enjoyed rapid economic success and in 1952 new factory buildings were erected. The company then focused on manufacturing gauges and specialized tooling and in 1955 it began production of military equipment. The company website states, justifiably, that Heckler & Koch helped rebuild Germany after it had been mostly destroyed during the war. They certainly had a major impact on the prosperity and economic growth of their region. In 1955 Germany joined NATO and the German Bundeswehr (Federal Defense Service) was founded. Soon there was a demand for a new assault rifle which should be produced on German soil. In 1958 Heckler & Koch was chosen to produce the G3 rifle. Unfortunately Edmund Heckler did not live to see the great success of this product, as he died in 1960. A few years later Heckler & Koch decided to produce a service pistol. 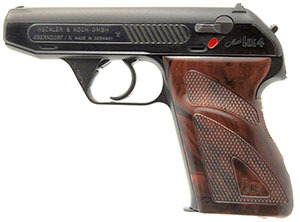 Alex Seidel had been the primary engineer involved in the production of the Mauser HSc pistol, so the HSc design formed the basis for the HK4. The project originated in 1966 and the HK4 went to market in 1968. The HK4 is a blow-back operated unlocked-breech semiautomatic pistol with a double-action trigger and an external hammer. Its name is derived from the tool-free interchangeability of the four barrels in calibers 9mm Browning Short, 7.65mm Browning, 6 .35mm Browning and .22 Long Rifle. The gun consists of four main components: slide, barrel and recoil spring assembly, frame, and magazine. The barrels have six grooves with a right-hand twist. Early barrels in 9mm short and .22 long rifle have linear grooves in the chamber, four in the 9mm and eight in the .22. In .22 these grooves extend the full length of the chamber. When the round is fired the hot gases flow into the grooves and the case “swims” in the chamber. So Heckler & Koch was able to compensate for different case materials and qualities. In the 9mm short barrel the grooves do not extend the full length of the chamber and are deeper at the center. In this case the pressure of the discharged shot forces the brass of the case to flow into the groove and thereby delays the opening of the breech. In theory these grooves allow for the elimination of a heavy slide and an overly-stiff recoil spring. This is not a new principle and was first used by the Fritz Mann Company in the Model 1920 Mann Pistol which had an annular groove in the chamber into which the cartridge expanded. The chamber grooves for both 9mm and .22 were eliminated in later production barrels, and so perhaps were not as necessary as the designer originally thought. 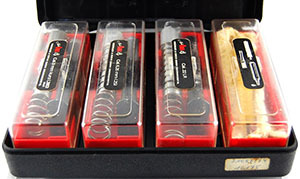 The strength of each recoil spring is specifically adjusted to the respective caliber. Hence each spring is fixed to its respective barrel so they do not get mixed up. The frame is made of pressure cast aluminum, which is surface hardened. To compensate for the stiff recoil of the light slide, a buffer plate is attached to the slide stop at the front of the frame. Early buffer plates consist of a piece of steel sheet with a plastic element on the front. Late buffers have a piece of sheet steel on both sides. Grips are made of black or brown plastic and are attached to the frame from the back with a single screw. The magazines hold eight rounds, except for the 9mm short which holds seven. The magazine bodies for the large calibers are all quite similar, though the .22 magazine has a distinctive look. Each magazine is inscribed with its caliber to prevent confusion. Set of interchangeable barrels and recoil springs for HK4, with cleaning tool. The rear sight, made of plastic, is fitted into a dovetail at the rear of the slide. The rear sight is locked by the breech block beneath it. To adjust the sight one must loosen the breech block plate, position the sight appropriately, and secure the breech plate again. The front sight is fixed to the slide by induction soldering. The safety lever on the left side of the frame blocks the firing pin and pushes it down out of reach of the hammer. In the safe position the firing pin is additionally locked in position. The hammer is designed in such a way that, whether cocked or not, no opening is left above or below it into which dirt or foreign matter might enter. 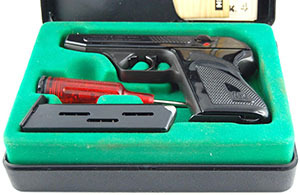 The HK4 came in a black plastic box with a green or red plastic inlay. We have also seen a few black paper boxes. Early pistols had a very simple cleaning rod, one end of which formed a screwdriver blade. Later pistols came with a red plastic screwdriver which contained a cleaning kit. The German manuals are quite interesting, because they show a possible technical evolution which we might not have noticed otherwise. 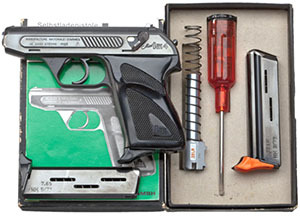 Early manuals show the first variant slide and a pistol with black grips. This manual shows nine cartridges in the magazine instead of eight. In a later manual this was corrected with a simple ink stamp and we find a deletion on the same page which was done with a ball pen. A later manual shows a late pistol which still has the early grips. The manual underwent some changes and also describes the new screwdriver. Perhaps there are more variants we have yet to discover. However, why do we mention this? The most interesting point is that the early cutaway drawing shows minor technical changes which were not mentioned in all the sources we have. We see differences in the length of the screw of the breech plate, the form of the striker, the hammer assembly, the magazine release, and the magazine which has a pin inside which limits the number of cartridges, etc. However, when we examine our pistols we realize that all our guns are as shown in the late manual. So , perhaps by accident, Heckler & Koch used an obsolete or incorrect cutaway drawing to illustrate the first HK4 manual. The HK4 cannot be cocked with the safety engaged, but a round can be chambered. If the slide is retracted with no magazine, or an empty magazine, the slide will lock open. When a magazine is inserted the slide will close, and if the magazine is loaded the first round will be chambered automatically. The slide will not close with an empty magazine in the gun. Once the magazine is removed, the slide will close by pulling the trigger, whether the safety is on or off. However, the safety locks the firing pin and additionally moves it down so the hammer cannot contact it, so if the trigger is pulled with the safety on the hammer will fall but the gun cannot fire. When the magazine is dropped by more than 2mm and the slide is closed, the trigger is disabled and the gun will not fire. Additionally the pistol can only be disassembled with the safety on--you can press the barrel release, but the slide will not come off the gun until the safety is on. After the last shot the slide locks open. The gun can be carried safely with a round in the chamber and the safety on, whether the hammer is cocked or not. Early guns have a very rough and heavy double action trigger pull in the vicinity of 9 kilograms, or about 20 pounds. The single action trigger pull is much lighter at about 1.7 kilograms, or about 4 pounds. According to George C. Nonte, writing in 1977, the later guns have a much improved double action trigger pull, though he still maintained that it was not as good as the Mauser HSc. To disassemble the gun for cleaning or changing the barrel the safety must be engaged. Remove the magazine and open the slide. Make sure the chamber is empty. Release the slide to its forward position by pulling the trigger. Push the barrel release button at the front of the trigger guard. Move the slide forward and lift it from the frame. Separate the barrel from the slide by pushing it forward against the force of the barrel spring (the magazine baseplate may be used for this purpose). Remove the screw that holds the breech-block faceplate and remove the faceplate itself. Guide the firing pin into the upper hole in the faceplate and reinstall the screw. The double-action trigger pull is impossibly heavy. One of us measures his at 20 pounds. (At first it was 21 pounds, but a thorough lubrication of the mechanism reduced it to 20. The double-action trigger on the Mauser HSc is much better, but we have been unable to determine exactly why the HK4 should differ so much. In the German manual HK calls the first shot “hingeworfener Schuss,” which we translate as “thrown shot.” Unfortunately, in a defensive situation the first shot is the most important and can often be the difference between life and death. On the other hand, the single-action trigger pull is a more reasonable 4 or 5 pounds. George C. Nonte, in his 1977 American Handgunner article, states that the later guns have a much better double-action trigger pull. At the range, shooting one of the early HK4 pistols, we found the gun reasonably accurate in single-action mode--certainly suitable for self defense. Using the double-action, we were lucky if we hit the target. The sights are quite small and difficult to see. One of us found that the small spur of the hammer pinches the web if his hand during recoil. 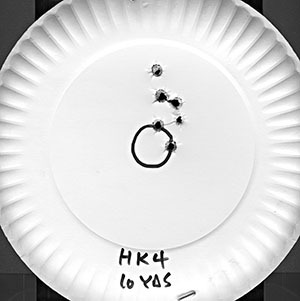 We experienced feeding problems with both hollow point and hardball ammunition in the 9mm Short (.380) caliber--this may be due to a weakened magazine spring. The gun is 45 years old and we do not know if it was stored with ammunition in the magazine. DE673766: Safety for firearm, registered 18 July 1935, granted 9 March 1939. This patent was an update to an earlier patent, DE670241. US2117826: Magazine latch mechanism, registered 20 August 1935, granted 17 May 1938. Alex Seidel. US2138213: Trigger and lockwork mechanism, registered 20 August 1935, granted 29 November 1938. Alex Seidel. 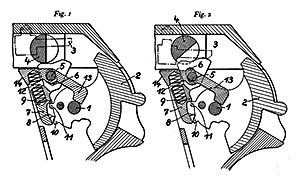 US2177227: Trigger and safety mechanism, registered 20 August 1935, granted 24 October 1939. Alex Seidel. DE691840: Locking device for pistols, registered 21 August 1938, granted 9 May 1940. Alex Seidel. This patent was an update to the previous patent, DE673766. Another patent related to the HSc was US2107359, granted to Ernst Altenberger for the HSc barrel retention mechanism. This patent was not utilized in the HK4, which used a redesigned latch that served the same function. DE1428770: Automatic Pistol, registered 20 May 1963, granted 30 January 1969. Alex Seidel. This patent is very close to the HK4 in its final version. However, the major difference is that the original design indicated a separate breech block for each caliber (see also: US3227046, GB1004894, CH418896, BE648141, AT243132). DE1205425: Automatic Pistol, registered 18 February 1964, granted 18 November 1965. Alex Seidel. This patent describes the new breech block faceplate which has holes for center- and “one or more eccentric holes for guiding the striker for the use of rimfire cartridges” (see also: US3287843, BE659846, AT250219, SE301923, CH430504). There are two primary variants. The right side of the slide is unmarked. The serial number is on the underside of the frame in front of the trigger guard. Early magazines did not have a magazine shoe. Later this was introduced for the customs police and eventually became available on the civilian market. Most HK4 pistols were sold to civilians, many in the US. The early U.S. importer of the HK4 was Harrington & Richardson, Inc. (H&R) of Worcester, Massachusetts. The guns have no special markings, but there is an insert inside the lid of the box that says “Harrington & Richardson, Inc.,” followed by the address, then “Exclusive U.S.A. Sales and Service for Model HK-4 Pistols.” The two U.S. patent numbers are provided in fine print. To the right of the inscription was the circular H&R logo with 1871 to the left and 1971 to the right. Harrington & Richardson delivered the HK 4 to customers as a standard two-box set in .380 ACP and .22 LR. The first 2000 guns, serial numbers HR00001 to HR02000, came with a gold trigger and name plate in a red velvet-lined wood presentation case with extra barrel and screwdriver. The HK4 with serial numbers above HR02000 have the standard black nameplate and trigger. A very limited number of four caliber sets were also imported by H&R and are much sought after by collectors. Additionally, we find engraved presentation pistols in very small numbers. According to George C. Nonte, eventually H&R’s policy on importing guns changed and the HK4 was dropped. 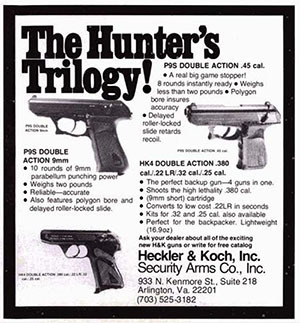 This probably happened sometime in 1974, as the HK4 is still listed as imported by H&R in the 1974 Gun Digest. 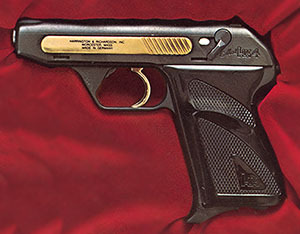 Jürgen Schönbeck reports that Heckler & Koch produced 38,200 pistols between 1968 and 1984 . 25,800 were sold on the civilian market. Serial numbers for these civilian guns run from 10,001 to 35,800. He also reports that the German Custom Police (Zoll) received 12,400 pistols in 7.65mm Browning between 1970 and 1974 and that some of these pistols came with .22 long rifle barrel sets for training. Serial numbers run from 40,001 to 52,400. However, a certain number of these guns were later exported to the US. They have the HK CHANTILLY Va inscription on the right side and show the word “BUND” on the frame clearly indicating that the guns were made for the German Government. There were also some engraved presentation pistols, though we have few details about them. The HK4 was the first step the company made in the self-loading pistol market. It brought together the pre-war know-how of the Mauser engineers and staff and the with modern production techniques developed by H&K. The interchangeable barrels were an interesting marketing technique. 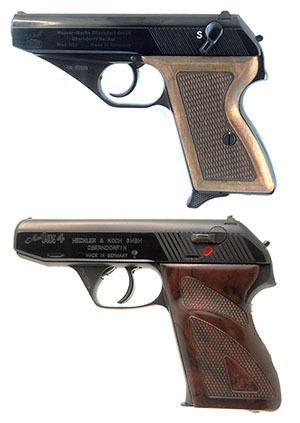 August Menz had also tried to compete against the Walther PPK with his PB Spezial with interchangeable barrels, and H&K tried the same thing 35 years later. Ultimately both failed, although Heckler & Koch went on to become one of the premier weapon-makers of Europe. Once other H&K pistols in larger calibers were in regular production, the HK4 was phased out. So the HK4 was, with the exception of the German Zoll and the Berlin Police, not very successful as a service pistol. Though it was moderately priced, production numbers did not approach the levels of the Walther PPK. By the end of production in 1984 it had to compete with modern self-defense and service pistols such as the Glock. The Heckler & Koch Model 4 may be considered one of the last dinosaurs of the blow-back era. Brandt, Jakob H.: “Patronen, Munition, Magazine. 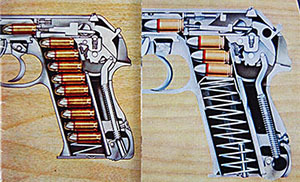 Magazine der Selbstladepistole HK 4“, Deutsches Waffenjournal, April 1989, p. 527ff. Hübner, Siegfried: “Kurzvergleich PPK-HSC-HK 4“, Deutsches Waffenjournal, February 1971, p. 134ff. Kersten, Manfred: “Heckler & Koch - Geschichte, Hintergründe, Informationen“, Deutsches Waffenjournal, July 1991, p. 1038ff. Kersten, Manfred: “Heckler & Koch - Geschichte, Hintergründe, Informationen“, Deutsches Waffenjournal, November 1991, p. 1658ff. Kersten, Manfred: HK Heckler & Koch, Die Pistolen 1952-1992, Service K, Kleve: 1993. Kersten, Manfred, Schmidt, Walther: Heckler & Koch: HK; die offizielle Geschichte der Oberndorfer Firma Heckler & Koch; Einblicke in die Historie, Beschreibung der Waffenmodelle, Darstellung der Technik, Weispfennig, Wuppertal: 1999. Nestler, Thomas: “Präsentationsstücke von Heckler & Koch“, Deutsches Waffenjournal, March 1991, p. 369ff. Nocher, Klaus: “Die Selbstladepistole Mod. HK 4“, Deutsches Waffenjournal, July 1971, p. 940ff. Nonte, George C.: “Heckler & Koch’s HK4: Four Caliber Versatility.” American Handgunner, May/June 1977, pp. 42ff. Schönbeck, Jürgen: “Die HK 4 - Nachruf auf eine interessante Pistole“, Deutsches Waffenjournal, December 1985, p. 1474ff. Sterett, Larry S., “Multem in Parvo--or the HK 4 Pistol.” Gun Digest, 1970. Weaver, W. Darrin; Speed, Jon; Schmid, Walter: Mauser Pistolen. Collector Grade Publications, Coubourg, Ontario: 2008. Heckler & Koch Company History. Copyright 2016 by Stefan Klein and Ed Buffaloe. All rights reserved.